There are some good values to be found if you are looking for the best cheap garage floor tiles on a limited budget. The problem however is that the market is saturated with so many brands that it’s hard to distinguish the good garage tiles from the bad. So how are you to know the difference? 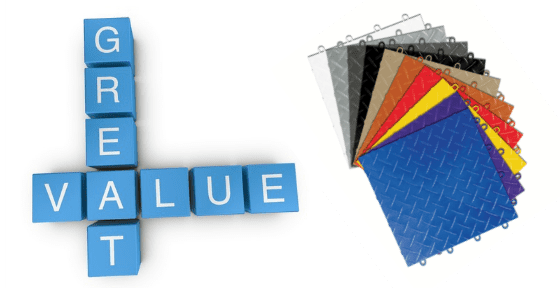 Well, we decided to put a short list together for you and came up with what we think are the two best values for budget garage floor tiles. These two choices are based on a few criteria including both price – less than $2.50 per tile, and quality. We have also included where we feel these tiles can be purchased for the best price and good customer service. If you are not familiar with this type of garage flooring option, you can read this article to learn the benefits of interlocking garage floor tiles. The first point we want to make is that buying cheap interlocking garage floor tiles does not necessarily mean that you are settling for a poor product. In fact, there are many quality options in low cost garage flooring that you you can choose from. The key is to look for quality garage tiles made in the U.S.A. Most American made interlocking garage tiles are manufactured with 100% virgin raw materials, good engineering, and much tighter quality control standards. As a result, they stand up much better to the abuse of a garage environment when compared to their foreign counter parts. Many times what distinguishes premium interlocking garage floor tiles from the cheaper versions is the finish of the tile surface, which is much more refined as compared to budget tiles, as well as higher rolling weight limits. 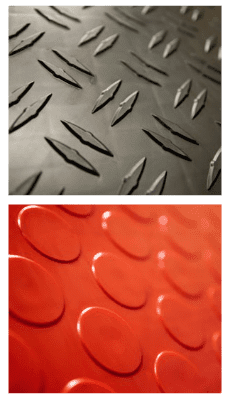 Some of the premium tiles are engineered to take the weight of large industrial vehicles, loaded fork lifts, and even medium to large aircraft. This isn’t always necessary for tile in a garage. Be aware that many of the cheap garage tiles that can be found via special deals on the internet, auction sites, and classifieds such as Craig’s List are made overseas. These are the ones you want to stay away from. They are the poor quality knock-offs that are manufactured with inferior raw materials and substandard quality control. They are known for scratching and staining easily, as well as fading and breaking at the locking mechanisms. Now that we know what interlocking garage tiles not to buy, let’s take a look at what we recommend. The first of our two picks for the best value in a budget garage tile would be the TrueLock Diamond garage tiles. Also known as TrueLock Standard garage tiles, these are American made by Speedway Tile in Cleveland, Tennessee. Like other quality garage tiles, these are made with high impact copolymer polypropylene and can withstand the abuses of a typical garage floor environment. They are available in 6 different color options that you can mix and match. One quality engineering feature that makes these tiles a good choice for the price is the 6 points per side patented interlocking system. Most other interlocking systems provided by the competition are only available with 4 locks per side. 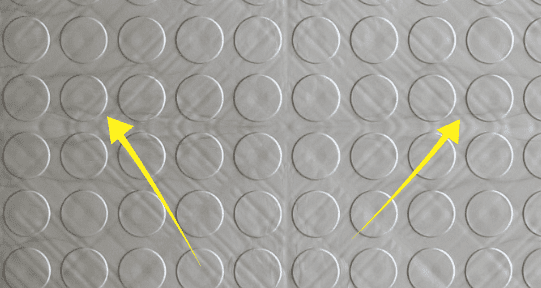 Another feature that we like about the TrueLock Diamond tile is the more traditional diamond plate design. Other tiles tend to have a cross hatch or double diamond design which may look a bit busy to some people. They also come with a 5 year warranty against manufacture defects and are rated for rolling vehicle weights of over 10,000 lbs. Our second recommendation for the best value in budget garage tiles would be the GarageTrac diamond and GarageDeck coined tiles. 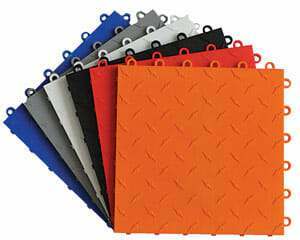 The GarageTrac tile is a patented double diamond design and is available in 10 different color options. The GarageDeck design is your typical coined pattern garage tile and is available in 7 different color options. Manufactured with high impact copolymer polypropylene, these tiles are American made by SnapLock Industries out of Salt Lake City, Utah. If SnapLock Industries sounds familiar to you, they are the same company that manufactures tile for RaceDeck. But before you start thinking that you are getting RaceDeck tile in disguise, we can assure you that you are not. There are engineered design differences in these two tiles as well as a less sophisticated cosmetic finish that puts these tiles in the budget category below RaceDeck. That aside, the GarageTrac tile is warrantied for 10 years against manufactures defects while the GarageDeck is warrantied for 12 years. Both have a rolling weight limit of 44,000 lbs. One nice feature about the GarageTrac tile is that the double diamond design provides for added traction in slippery environments. The one drawback to that however is that the design can make it a little more difficult for cleanup. The double diamonds tend to collect dirty soapy water when running a mop over them. Though available from many retail distributors, our recommendation for the best place to buy TrueLock Diamond tile would be Garage Flooring LLC. They guarantee the lowest delivered price. If you find the same tile for less, they will beat the advertised price by 110% of the difference. They also provide free shipping and have a very knowledgeable staff to assist you. There is nothing more frustrating than dealing with a person at a call center who can only answer questions from a product stats sheet. Garage Flooring LLC also provides for some of the best customer service that you can find online. Justin Krauss is the founder and President of the company and strives to provide the best customer service to make your purchasing experience a pleasant one. Many times you can take advantage of coupon codes and other specials deals that they offer to get an even better price than that advertised. Our recommendation for the best place to purchase GarageTrac and GarageDeck tiles is from Big Floors. They are a retail distributor for SnapLock Industries and offer a 120% low price guarantee on the same product. They provide free shipping as well and have knowledgeable staff on hand to answer all of your questions. As a side note, this same tile can be purchased under the Grid-Loc name as well from a few different retail distributors. Because Big Floors is associated with SnapLock Industries, we found that they provide the best price and in our opinion the best customer service for this tile lineup. We mentioned earlier that budget interlocking garage tiles have a cosmetic finish that is not as refined as premium tiles. Costs have to be reduced somewhere to offer the lower price point and many times it is in the tooling for the manufacturing process and/or the exact precision of the extremely expensive molds that are constructed. As an example, you can see the outlines of the bracing from underneath through the surface of the tiles. Both tile brands discussed here have this to some degree as do all cheaper tiles. We found that it’s most noticeable in the GarageTrac and GarageDeck tiles as compared to the TrueLock Diamond tile as the photos illustrate below. The finish of the GarageTrac and GarageDeck tiles is glossier like a premium tile while the TrueLock Diamond tiles on the other hand have a more satin or matte finish. One aspect we want to point out however, is that the TrueLock Diamond tile finish is more consistent and uniform throughout the surface of the tile as compared to the other brands. To illustrate further, looking at the photos of the GarageTrac and GarageDeck tiles you can notice the differences. The GarageDeck tile in particular has a marbling effect of the color in the finish from the injection mold process. You can see it in the photo below. The GarageTrac tile doesn’t seem to have this marbling effect but with the multitude of bracing showing through, along with the double diamond design, it does create for a busier look. Does this make any one tile better than the other? Structurally it does not since it is only cosmetics. It really comes down to personal preference. It’s easy to pick out discrepancies in a single tile, but once many are laid together they take on a unique look of their own. So which cheap garage tile is best? We would feel comfortable choosing any one of these tiles for our own garage flooring if looking to save some money. Both of these brands of budget interlocking garage floor tiles are going to provide you with a good value. They are American made and sold by distributors that stand behind their product. If you were to judge the tiles only on the warranty and rolling weight ratings, then the GarageTrac and GarageDeck tile surely have the advantage. However, we have found that most manufacture defects with interlocking garage tiles happen within the first year or less of a tile’s life. Secondly, when was the last time you pulled into your garage with a vehicle weighing more than 5 tons? So keeping that in mind, any one of these tiles is going to stand up just fine to a typical garage environment. Garage Flooring LLC and Big Floors each have easy to use (and fun!) tile design software on their websites to help you design your own floor and they can answer any questions that you may have, including questions regarding installation. What it may come down to is pattern design preference and overall looks. If you aren’t sure which tile you like best, be sure to take advantage of the free samples that both companies offer in order to help you make a decision that you will be happy with. Occasionally you can find lower pricing on the same or similar type garage floor tiles from other distributors or warehouse clubs. Keep in mind however that this reduced pricing is only available when ordering in bulk packs of 20, 30, or 40 tiles at a time. This rarely works out to a better deal because you end up having to purchase more tile than you need. Don’t forget to price the edge pieces that you will need as well. Though the tile might be 10 cents per unit cheaper, the edge pieces usually will cost you more. Don’t forget to consider tax also. Depending on what state you live in, you may not have to pay sales tax when ordering online. And lastly, don’t forget about customer service. The warehouse clubs might have a comparable price, but they don’t have custom design software or anyone to answer your questions when you are assembling your floor or trying to figure out how many edge pieces you may need for your own design. So if finding the best cheap garage floor tiles are in your budget, take a look at these two brands for yourself before you make a purchase. We are confident you will discover that the quality and price are the best you can find for your dollar. I bought garagetrac tiles. Look fantastic. I have the male end on the edge. Need a female edge with the loops protruding from the tile but I don’t see a matching female edge. Can you recommend one? Hi Mitch. You should be able to find everything you need for edge ramps right here.